If you like how your Mac keyboard feels to the touch, you may like the way some of the keys look and feel as wearable art. 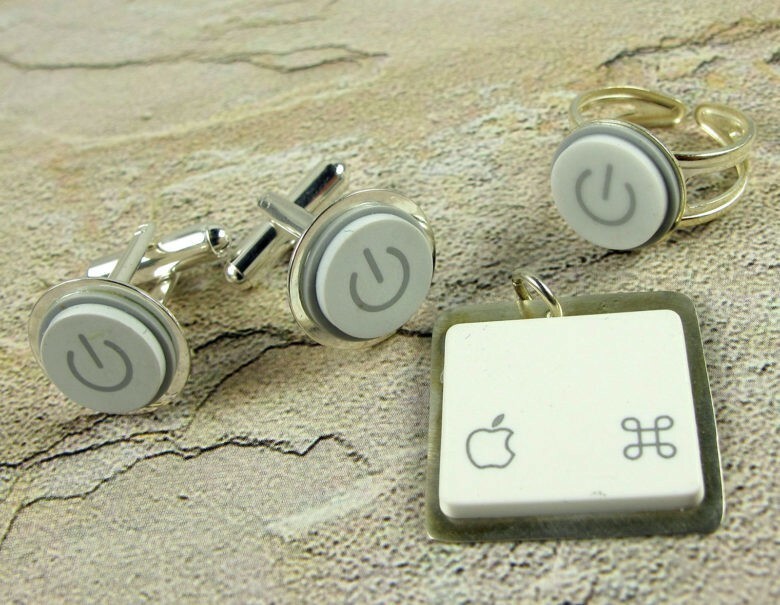 Pennsylvania artist Stacey Peterson salvages the keys and even the power button to make necklaces, cufflinks, and other wearable keyboard pieces that she sells to eager Apple fans on her Etsy site. In most cases, the key or power button engages in that satisfying click. While Apple continues to produce desirable electronic devices, other support industries have emerged to provide cases, sleeves, and peripheral hardware accessories. Like the T-shirt or toymakers who celebrate Apple culture, Peterson is part of a cottage industry that engages the Apple fan’s emotional motherboard, the circuits that spark that loyalty, nostalgia and a sense of coolness. This story will be included in the second edition of The Cult of Mac book, originally published in 2004. Much has changed for Apple and its legions of fans! “I have made a few PC pieces, but most people want Mac keys in their jewelry,” says Peterson, who learned her craft at the William Holland School of Lapidary Arts in Georgia. “I’ve made at least 1,000 pieces and I’ve sold almost 800.”Peterson, who works by the name Sta-C, makes beautiful classic jewelry with gemstones and metals, like sterling silver, preferring to use methods rooted in pre-industrialized times. One of four owners of an art gallery in Elkton, Md., her “Keyed Up” jewelry is sold exclusively on Etsy. Peterson works from “pockets of chaos” in her home, careful to keep unrelated materials separated. The discarded keyboards she finds on eBay and other sources stack neatly. She is trying to collect as many keyboards with the old command key with the Apple logo. The amateur Apple folklorist understands the complicated history of the old Apple key. Designers wanted to use the logo to make it easy for users to remember key commands, but Steve Jobs that the company was in danger of overusing the logo. So designers came up with a Swedish-style floral emblem for the command key. 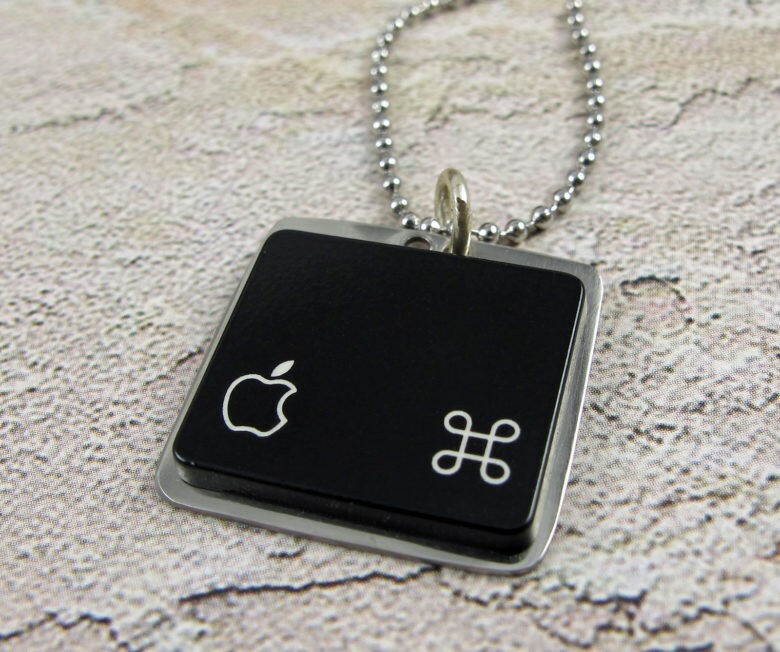 The Apple returned to the command key after Jobs’ departure from Apple in 1986. 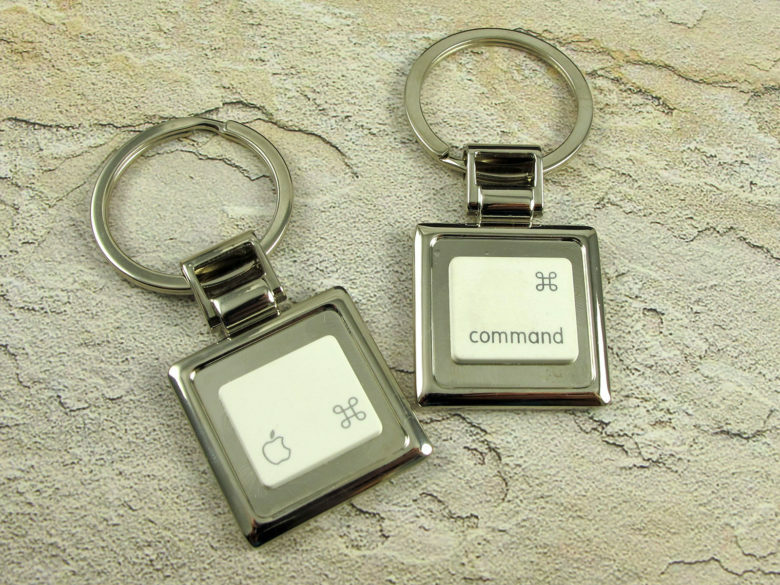 The Apple logo disappears and the word “command” appears on the key in 2007. “I am trying to scoop up as many as I can find,” Peterson says. If she can find the keys, especially the circular power key with the surrounding metal intact, she can make the keys on her jewelry click. Peterson’s made her first computer-key jewelry when her daughter was in junior high and she requested a piece be made for a friend, using her old PC laptop. Her daughter just recently graduated from college and is now a computer programmer. She has been selling the “Keyed Up” line on Etsy, since 2009. Apple keys can be found on necklaces, earrings, cufflinks, rings and keychains, on which she is starting to use more of the alphabet. This entry was posted in Apple news and tagged apple, Apple nostalgia, Cult of Mac 2.0, Etsy, Jewelry, Sta-C Peterson. Bookmark the permalink.